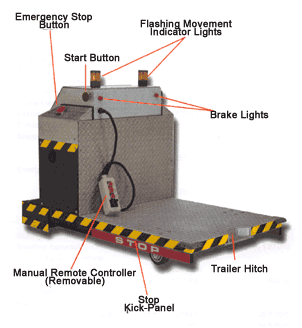 as the automated guided vehicle or AGV that moves along defined pathways between delivery points or stations. A typical AGV will consist of the frame, batteries, electrical system, drive unit, steering, on board controller and work platform. Modern AGVs are computer-controlled vehicles with onboard microprocessors. Tracking the material in transfer and directing the AGV traffic. One of the major advantage of AGV is ease in modification given by the guidance system for changing the guide path at low cost compare to conveyors, chains, etc. Another benefit is: guide path is flexible which means intersection of path is possible. Generally, guide path does not obstruct another systems. The guidance systems can be selected based on the type of AGV selected, its application, requirement and environmental limitation. Wire-guided –An energized wire is rooted along the guide path. The antenna of the AGV follows the rooted wire. Optical-Colorless florescent particles are painted on the concrete/tiled floor.Photosensors are used to track these particles. Inertial-The guide path is programmed on a microprocessor which is fixed on the AGV. Sonar system is incorporated for finding obstacles. Infrared-Infrared light transmitters are used to detect the position of the vehicle. Reflectors are affixed on the top of vehicle to reflect the light. A routing system is used to select the vehicle which is positioned with the optimum path. A network controller gives the destination, while the on-board controller navigates the vehicle.